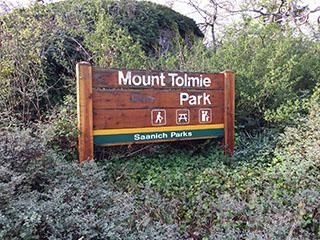 Mount Tolmie Park. Mt. Tolmie was officially named in 1934 after Dr. William Frazer Tolmie, a biologist. Panoramic views of Saanich and Victoria across to the Olympic Mountain Range and to Mt. Baker in the Cascades will entice you to hike to the 120m. elevation of the summit. The combination of built forms (such as the water reservoir) and natural pathways through the rocky outcrops provide many different places to explore.